Pitchoun! 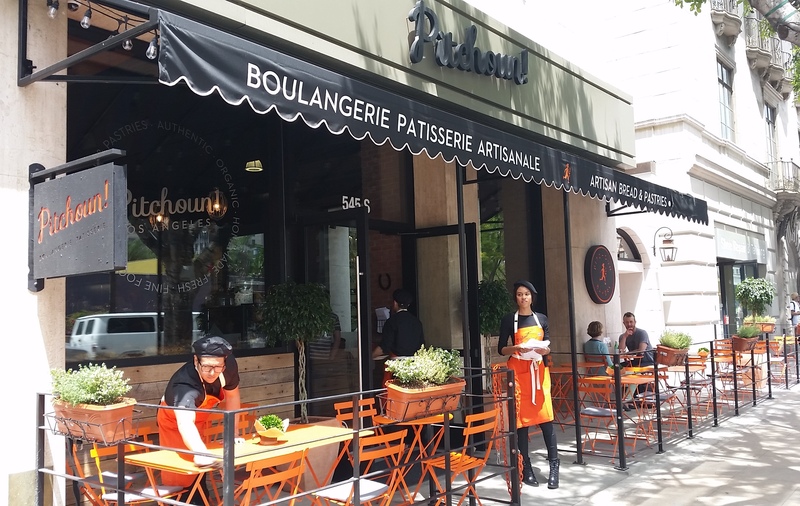 Boulangerie and Patisserie is officially open in DTLA. The French bakery and pastry shop is located on the ground level of the Pac Mutual Building along Olive Street across from Pershing Square. In case you were wondering, it is pronounced PITCH-OON and it is a French affection term meaning “kiddo.” Pitchoun is much more than a bakery. They also offer up an array of healthy salads, sandwiches and soups. According to their website, everything is home-made daily on the premises from scratch with the highest quality ingredients, using traditional French recipes. We checked it out for lunch today, along with a lot of other curious people. The place was crowded with the line to order stretching out the door. They did a great job with the interior of the restaurant. They really captured the feel of an indoor/outdoor French café. The “la carte” (that’s the menu in French) is extensive. They offer up hot and cold sandwiches, salads and tartines. I had no idea what a tartine was, but I ordered the Sunshine tartine ($11.45) with prosciutto, zucchini, ricotta cheese, pine nuts, rosemary, garlic on fig & nut bread. Ends up tartine is the French way of saying open-face sandwich. It was served on a large wooden cutting board with a small green salad. It was good, but eating prosciutto in an open-face sandwich isn’t that easy. My husband ordered the Summer sandwich ($11.25). It was also prosciutto with mozzarella, grilled zucchini, tomatoes, pistou vinaigrette and basil on ciabatta bread. He loved the bread. As we were sitting there eating, we watched lots of different Pitchoun creations being delivered to the tables around us. Let me tell you, next time I’m getting the French hot dog. OMG! It looked awesome. And next time, I’m also not skipping dessert. They offer up an amazing looking selection of pastries and verrines (I had to google it. They are little glass jars) of chocolate mousse and pot de crème. Here’s my suggestion, before you go to Pitchoun, take a look at their menu online and figure out what you want in advance so you don’t have to waste time (and hold up the line). Bon Appetit! Pitchoun! Bakery 545 So. Olive Street (between 5th and 6th Streets) 213.689.3240. This entry was posted in DTLA Restaurant and tagged Bakery, Boulangerie, Dessert, Downtown LA, Downtown LA Restaurant, Downtown Los Angeles, DTLA, DTLA Restaurant, French, Pac Mutual Building, Patisserie, Pitchoun. Bookmark the permalink. I used to live in DTLA not too long ago. Boy… Have things changed. There is a new coffee shop or restaurant that pops up every week! I miss it so much and wish I can move back.